This extraordinary flag of 13 stars in the Trumbull Pattern is a national treasure and likely dates to the late 18th or very early 19th century. 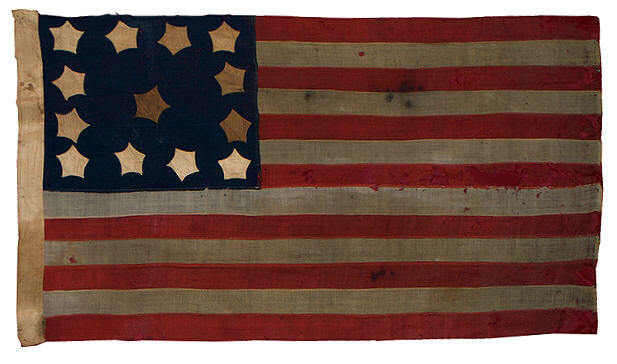 It survives as one of the earliest 13 star flags and a beautiful folk art form of the American flag. The most striking attribute of the flag is its unusually bold, nearly pentagonal stars, which are double-appliqué, meaning that each side of the flag has its own set of stars, stitched back to back. Interestingly, the irregular shape of the stars and their alignment are carefully matched to their opposing counterpart. The stars and hoist are made of a very finely woven cotton fabric. 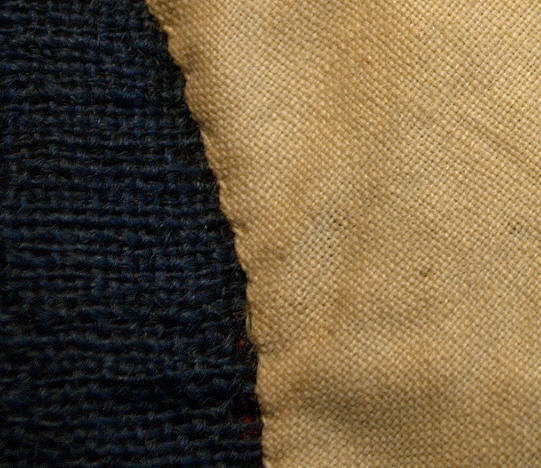 The entire flag is hand stitched, and the experienced seamstress carefully pieced and finished the seams between the stripes on both sides of the flag. The wool bunting appears to be a hand loomed wool, as seen in earlier flags. The weave is especially coarse, dense, and irregular. The red stripes are a dyed a carmine red, having a very slight purplish tinge unlike any other flags in the Rare Flags collection. The coloration is indicative of a cochineal-based dye. The hoist of the flag consists of a sleeve nearly 3 inches wide, as expected for an 18th century or very early 19th century flag. permanently associated with his name. Antique flags in the Trumbull pattern are extremely rare. For flag collectors, Trumbull pattern flags are one of the rarest 13 star patterns when compared to other 13 star patterns such as the 3-2-3-2-3 pattern or the 4-5-4. Perhaps ten or fewer are known in the pattern, and the discovery of any new examples, as in the case of this flag, which formerly belonged to a judge from Texas, is a fantastic and exciting event.